Greven, 22st December 2016. 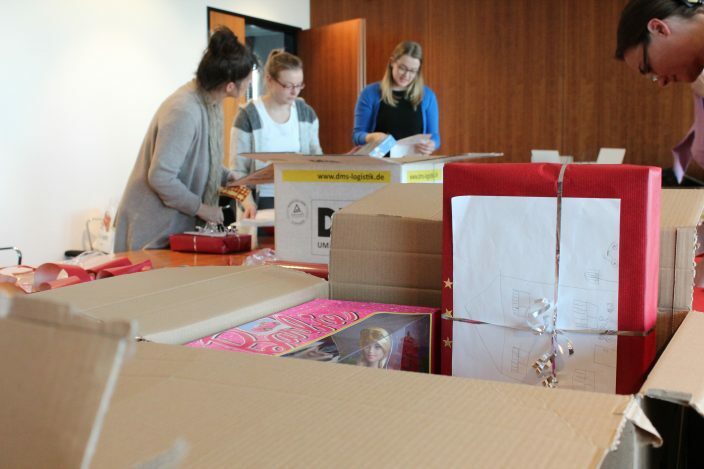 Employees from Fiege Logistik donated over 110 Christmas gifts for deprived children to various facilities in Greven and Münster. For four weeks, the children’s wish lists had been attached to the Christmas tree set up at the family enterprise’s System Headquarters. 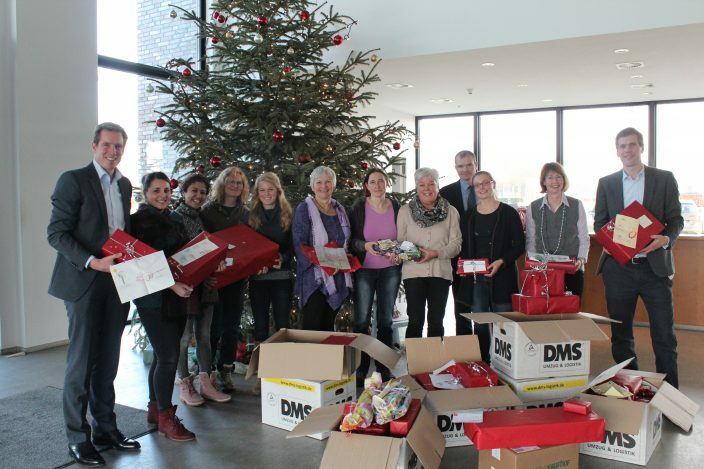 On Wednesday, representatives from the youth welfare unit, Kids & Co. Greven; the child and youth welfare service, Outlaw from Greven; the Association of Social Therapeutic Facilities, VSE; from Evangelische Jugendhilfe Münsterland and the Emsdetten-Greven Caritas association, came to Fiege to collect around 60 gifts for the children. Fiege employees from Greven, but also from other locations and countries who had seen the wish lists hanging on the tree at the Fiege tower at Greven airport, had set out on their own to organise the gifts. 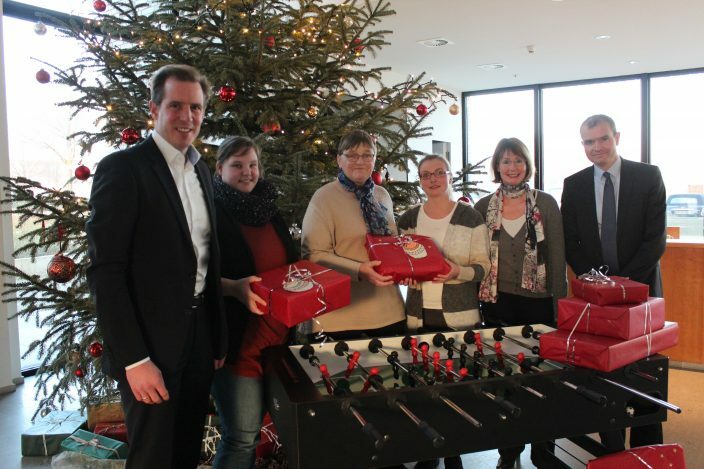 Foundation chairman Holger Werthschulte: “Many colleagues whose children are already a little older had a lot of fun picking out presents for small children.” In a joint effort, ten Fiege employees wrapped up the gifts on Tuesday morning. “We put some Christmas music on, and there were cookies and coffee. 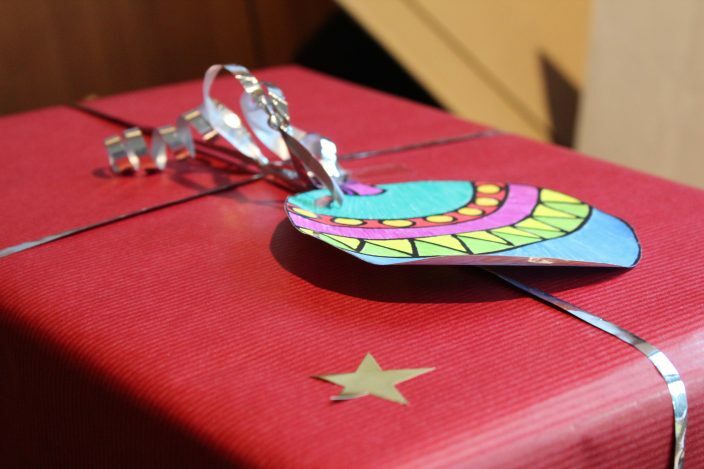 Add to this that you just know that, when you fulfil a very specific request, gift wrapping takes on a whole new dimension of joy”, said Sonja Frühauf from Personnel Management at Fiege. The Christmas campaign to gift children from different social facilities around Greven came from Sonja Frühauf and Anne Bittorf, who is also involved with the Josef Fiege Foundation. Next to the wishes of children from Greven, there were more than 50 other wish lists hanging on the tree from the children currently in the care of Vinzenzwerk Handorf. The social and remedial home houses 187 children who, for many different reasons, can no longer live with their parents. On Tuesday, two employees came to collect the gifts in Greven. “The work you have been doing deserves our utmost respect”, said board member Jens Fiege in his address to Vinzenzwerk staff members. He added: “Much too often we forget that there are children who are very poorly and for whom life is not easy. Thank you for caring.” Fiege’s international management also gifted a football table to Vinzenzwerk, plus a 500-euro cash donation. The Christmas campaign is set for a repeat run in Greven next year. “And even at other larger locations, we will be running this great campaign next year”, announced Holger Werthschulte.